The colugo is a little-known mammal much like a flying squirrel. They’re pretty darned cute and they can glide up to 200 feet. High in the trees of Southeast Asia lives a small creature unbeknownst to much of the world. The colugo is a gliding mammal that ‘fly’ up to 200 feet between trees without losing much altitude. Their gliding membrane, the patagium, is one of the more striking adaptations in the animal kingdom. Also known as flying lemurs, even though they’re not really lemurs, the colugo is probably the most well adapted mammal for flight. The patagium fills in all the space between their legs and tail. This is about as much flight surface as a mammal can have without evolving a full wing. Colugos can grow to about a foot long (14-16 inches) and weigh between 2 and 4 lbs. Colugo babies are completely reliant on their mothers and at birth may weigh only an ounce. They spent their first 6 months clinging to mom’s belly. The mother protects the young by folding her patagium around them like a pouch. 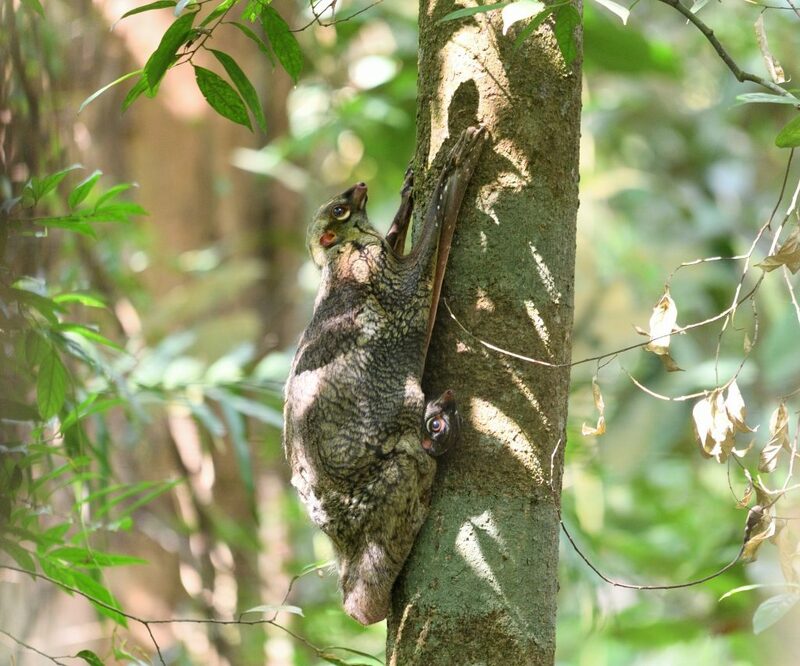 There are 2 species of colugo. Galeopterus variegatus (Malayan colugo) and Cynocephalus volans (Philippine colugo) both live in the rainforests of Southeast Asia. Their range covers Thailand, Malaysia, Java, Borneo, Vietnam, Kampuchea, and the Philippines. Colugos are considered by the IUCN to to be at least concern but they’re still vulnerable to habitat destruction and hunting. They are frequently hunted for their meat and fur. According to Wikipedia, colugos possibly account for up to 90% of the diet of the Philippine eagle. Colugos are herbivores. They eat leaves, flowers, & fruit. It’s also likely that they munch on shoots and sweet sap from trees. There is no evidence of these creatures eating insects or other small mammals.